It is never an easy thing to experience the departure of a loved one. Those of you who have lost someone in your life, through death, through migration, through separation, through unavoidable circumstances, will understand the experience – it feels like something is wrenched from within, a part of us dies and leaves with that person and we never seem to recover it. Today, as we read the account of the Lord’s Ascension, our hearts also go out to the disciples who stood by gazing into the heavens. They had already suffered the pain of experiencing the death and loss of their Master, and now they have to endure a second parting. After the resurrection, Jesus had returned to his disciples on many occasions, breaking bread with them and instructing them. Their hopes were raised in believing that this time, things would be different; he would never leave them again, but he did. We know something of their loss. But wait a minute, the gospel taken from St Luke’s account ends on a strange note, “they worshipped him and then went back to Jerusalem full of joy; and they were continually in the Temple praising God.” It is strange because this sort of behaviour would usually not be associated with those in a state of grieving. This little observation is not just an insignificant contextual footnote or editorial error. It points to the very heart of today’s feast and its significance for us Christians. 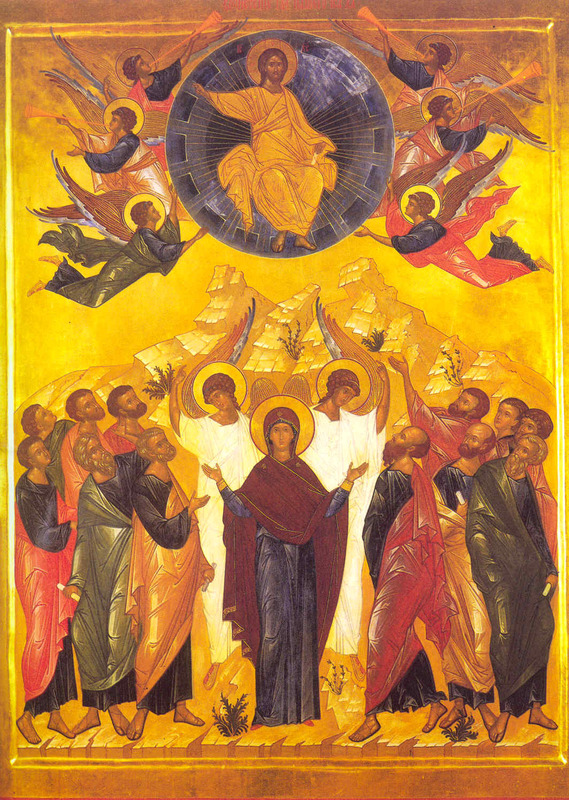 You see, the Ascension does not mark the end of Our Lord’s relationship with His disciples or with His Church but the beginning of a new way of His relating to the world - in and through His Church. Think about why Our Lord left in the first place. It’s not because he was tired of his friends or was looking for new excitement in his life. No, Jesus left in order to finish what he had come to do in the first place. Jesus had come down from heaven in order that heaven might be opened to us, because through our sin we had effectively shut ourselves out. Our Lord Jesus Christ is now the bridge that links heaven and earth. When He ascended into heaven, he took with Him the human nature that we all share, but that He redeemed through His death and resurrection. This means that because Our Lord Jesus Christ is now in heaven, you and I can hope to join Him in heaven. Now, we understand why the disciples were filled with joy. This should also fill us with both joy and hope. At his ascension into heaven – far from leaving us behind to fend for ourselves – the Lord has made concrete the fruits of his resurrection, and continues to abide with us, both through his intercession for us in heaven, and in his presence in the sacraments of the Church. In a very particular way, of course, Christ’s presence continues in the very thing we are here to do this morning. In the Eucharistic sacrifice, in the celebration of the Holy Mass, we find Christ really and truly present under forms of bread and wine. In our worthy reception of Holy Communion, we receive the Body and Blood of the same Lord who underwent the passion, death, resurrection, ascension, and glorification which we now celebrate. In this way, Christ gives himself for us and to us, so that we might continue to be united with him in our lives here on earth, and so be made ready to spend eternity with him in heaven. On this great feast of the Christian year, we are drawn once more to consider the abiding presence of Christ in the Eucharist. We see within this Eucharistic celebration, the true meaning of the words we’ve just heard in the gospel, “they worshipped him and then went back to Jerusalem full of joy; and they were continually in the Temple praising God.” Just like the early disciples, whenever we worship here at the altar of the Sacrifice of the Mass, we already anticipate the eternal worship of the altar of heaven. Just as our earthly worship is bound to the worship of heaven, so our earthly lives are – through our baptism – tied to the eternal life offered us in Christ. May this solemnity of the Ascension of the Lord, then, be a feast of joy and renewal for us. If we seek also to enter the heavenly kingdom – as is our destiny – we must begin to live the life of heaven here and now, to be saints not after death but in our lives. If we wish to live in His abiding presence in all eternity, we must first learn to focus our lives on his abiding presence here on earth in the Blessed Sacrament. Here we live in hope; may that hope become a reality.